Robin van Persie out of Manchester United? London: Robin van Persie admits he doesn't know if he will be offered a new contract when his current deal expires with Manchester United. Van Persie scored 30 goals and won the Premier League title in his first season with United following his move from Arsenal, but last season he struggled for fitness and form. And this term he has found the net just eight times during another disappointing campaign. The 31-year-old's United contract expires in 2016 and, asked on Monday if he would like to extend his stay at Old Trafford, the Netherlands striker said, "It is not up to me. For the moment I am staying here for 18 months. That is it really. I can't look into the future. I don't know what is going to happen after that. We shall have to wait and see." Van Persie was candid about his poor form and conceded that his teammates are struggling as well. United's 0-0 FA Cup draw with fourth tier Cambridge last week was littered with mistakes, while in the Premier League Louis van Gaal's side have just three points more than they had under his much-maligned predecessor David Moyes at this stage last term. 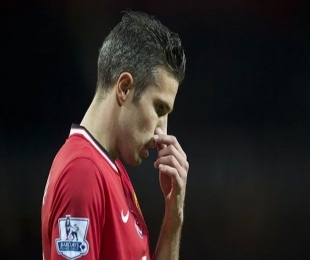 "Obviously we are not scoring enough goals, including me," van Persie said. "Everyone feels responsible. I do, definitely. This year I have played something like 20 games and I have scored eight goals. I am not happy with that. I want to score more. It makes so many people happy, including me," he added. Although Van Persie's confidence may have taken a hit because of his poor start, his faith in his manager has not wavered one bit. Van Gaal made Van Persie his captain with the national side and the move paid off as the unfancied Dutch team made it through to the World Cup semi-finals last year where they were defeated on penalties by Argentina. "I have known him for over two years now, I know how he works," van Persie said. "We believe in him. We will still believe in him. We are confident it will change. Him and his coaching staff and we as players are trying everything we can to win games, not only win games but win them in a nice way as well," van Persie added. He also admits United's draw at Cambridge last week was not good enough. But the forward, who won the FA Cup with Arsenal, has been encouraged to see the likes of Chelsea, Manchester City and Tottenham exit the competition over the weekend. "After the game against Cambridge, everyone was a little bit down. But in a way on Saturday the whole mood changed. City were out, Chelsea were out and suddenly we are in it with a home tie against Cambridge. We are the highest-ranked team left in the competition," van Persie said.